No-one likes the phrase “laying down the law.” But that’s what the unseen LORD does on mount Sinai. As we saw yesterday, God the Son has brought the people to God the Father. And now they learn some house rules. The order is important. They’re not told in Egypt “If you obey my commands I will redeem you from slavery.” No, they are redeemed apart from law. The people do not clean themselves up to earn their salvation. They are saved first and in this redemption they learn how to be the LORD’s people. 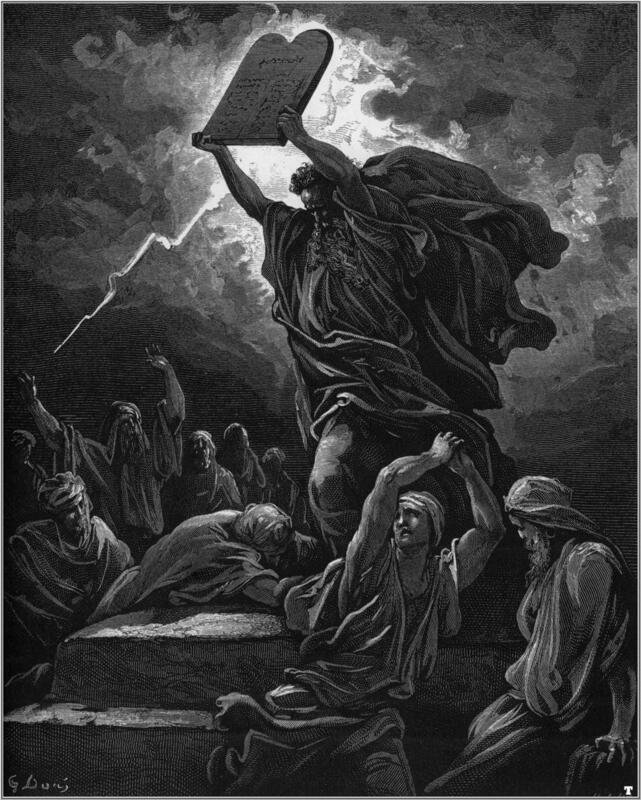 Thus on mount Sinai, Israel is given the ten commandments. Except that the Bible never calls them “the ten commandments” (dare I say it, this is a mistranslation by the KJV, but one that is followed by most of the English versions). It’s “the ten words” that are revealed on Sinai. These words from the LORD are a revelation of the Good Life. The Good Life is a life of ‘loving God’ (the first four words) and ‘loving others’ (the last six). As such it’s a perfect description of the life of God’s Son. He is the One who supremely loves His Father and loves his neighbour. Even in eternity, this has been His life. And so Israel (also called “the son of God” – Exodus 4:22), is given the life of God’s Son to live out. These words describing the Good Life were death to the Israelites. The law is good. But we are not. And a good law applied to a bad people means death. Even God’s people, with God’s law can’t live the Good Life. The law can only describe this life for the people – it can’t produce it in them. Actually the people become distanced from the LORD after the speaking of the law. They want Moses to stand in between them and shield them from this holy God. Perhaps you are thinking, Promise? What promise? Well think about it. “Thou shalt” is a strange way to phrase a law is it not? After all, it’s not in the imperative (the grammatical mood for commands). God could easily have said “You must not murder”. But God didn’t say that. He said “You shall not murder.” You won’t. You’re my special people. I’ve saved you. You won’t lie, you won’t murder, you won’t covet. You won’t. It’s future indicative (for grammar buffs). Now obviously that still carries commanding force. When a mother says to two screaming children “There will be peace in this house”, by golly there had better be peace! And when God says there will be peace, there’s a huge commanding force to that. But there’s also promise there. Because, what if there is a Person called Peace? What if there is an actual embodiment of the Good Life? And what if He lives out the life of God’s Son as one of our brothers?